After a week of anticipation, Democrats learn that Mills beat Adam Cote by 8 points in the nation's first statewide election with ranked-choice voting. This is a ranked-choice election. As candidates are eliminated and votes redistributed, the first candidate to top 50 percent wins. 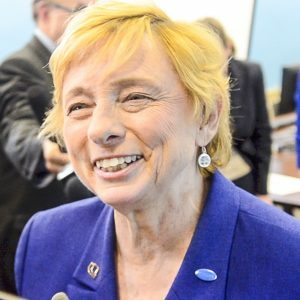 AUGUSTA — Attorney General Janet Mills won the Democratic nomination for governor on Wednesday following the nation’s first use of ranked-choice voting to decide a statewide election. 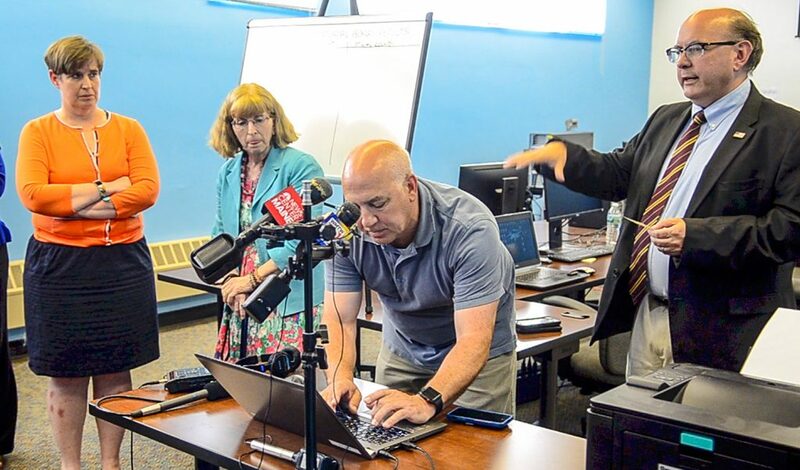 After days of scanning, downloading and certifying ballots, the Secretary of State’s Office ran all of the results from the June 12 election through the ranked-choice voting tabulation software. The result: Mills won the seven-person primary with 54.1 percent of the vote, followed by veteran and attorney Adam Cote with 45.9 percent, in unofficial results. The margin between Mills and Cote – the Democratic front-runners following the balloting last week – was just under 9,500 votes once all of the ranked-choice votes had been reallocated. 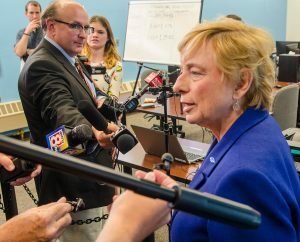 Janet Mills talks to reporters Wednesday after final ranked-choice vote totals showed she had won the Democratic nomination for governor. At left is Secretary of State Matt Dunlap. A former legislator and district attorney from Farmington, Mills will face off against Republican Shawn Moody and two independents, Alan Caron and Terry Hayes, in November’s race for governor. Both Mills and Hayes, who currently serves as state treasurer, will be vying to become Maine’s first woman governor. Mills, 70, said she will run a positive campaign “about moving the state forward and about bettering the prospects for the people of Maine,” while praising the contributions of her primary opponents. Moody, a Gorham resident who founded an autobody repair chain, likely hinted at one of his lines of attack against Mills in his response to her victory. Moody, who ran for governor as an independent in 2010, won last week’s Republican primary outright, avoiding a ranked-choice tabulation by capturing 56 percent of the vote in the four-person race. Cote, a retired major in the Army Air National Guard as well as an attorney and renewable energy entrepreneur, vowed to support the nominee and urged other Democrats to do the same. Melissa Packard, director of elections, left, and Julie Flynn, deputy secretary of state, watch as John Lento of Election Systems Software runs the laptop that’s doing the ranked-choice voting tabulation Wednesday in Augusta. Secretary of State Matt Dunlap, right, tells the audience what’s happening. With the ranked-choice tabulations now complete, the primary results set up a race between a businessman with no political experience but who surprised many with his margin of victory in the Republican primary and a Democratic attorney general with decades of experience in state politics. The pair and the two independents will be vying to replace Gov. Paul LePage, a controversial and brash-talking Republican still beloved by many in his party but strongly disliked by many Democrats. Mills rose to the top of a seven-person Democratic field in which candidates shared many of the same policies but had starkly different backgrounds and styles for achieving those goals. During the primary campaign, Mills emphasized her track record to standing up against LePage and President Trump as attorney general, as well as her electability in rural Maine because of her roots in the 2nd Congressional District. She also pledged to work to improve jobs and Maine’s economy, to expand broadband internet access in rural Maine, to put a higher emphasis on addressing the state’s opioid crisis, to embrace Medicaid expansion and to bring a more civil tone to Augusta than under LePage. Although ranked-choice voting has been used in several cities across the country – including Portland, Maine’s largest municipality – last week’s Maine primaries were the first time in the nation the process was used in statewide elections. The system was also considered a wild card in the two crowded primaries for governor. The scene at the ranked-choice voting tabulation headquarters was electric – and decidedly jovial – Wednesday night as dozens of people crammed into a small conference room to watch the final calculations. Thousands more were watching various livestream videos of the proceedings online, hoping to see not only the results but the unprecedented process play out. The standings in the Democratic primary did not change between the first-choice votes cast on Election Day and the final tabulations after accounting for the ranked-choice system, although the margins did shift. Mills led Cote 33 percent to 28 percent – or by 6,252 votes – after Election Day, according to results supplied by the Secretary of State’s Office on Wednesday night. However, by the time the other five candidates’ votes had been reallocated using the ranked-choice system, Mills’ lead over Cote had increased to 9,487 votes. In the fourth and final round of tabulations, more supporters of third-place finisher Betsy Sweet favored Mills over Cote, pushing the attorney general over the 50 percent threshold. A happy Janet Mills talks to reporters Wednesday after the ranked-choice voting tabulation showed she had won the Democratic primary for governor. The ranked-choice process played out largely along the timeline that Secretary of State Matt Dunlap’s office outlined the week before the June 12 primaries. Because of the logistics of gathering so many ballots in one central location and then loading them into the computers, Dunlap had said results would likely not be available until this week. On Wednesday, Dunlap said he was pleased with the way his staff handled the challenge of implementing the new system. Likewise, Kyle Bailey with the Committee for Ranked Choice Voting, which led the two ballot initiatives to implement the process, called Wednesday a historic day as Maine successfully utilized a system that he says will lead to better, more broadly supported candidates.